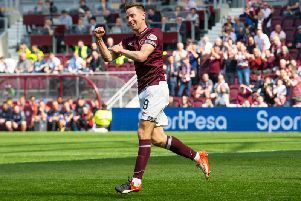 Hearts legend John Robertson believes promotion to the Premiership will allow the Edinburgh club to continue steadily rebuilding at all levels. The former striker, who has a dual coaching/commercial role at Tynecastle, is eager to see extra income from top-flight football used to continue the progress made in the last year. A season in the Championship saw Hearts romp to the league title and finish 21 points ahead of second-placed Hibs less than a year after exiting administration. Owner Ann Budge has demanded a conservative approach based on spending within the club’s means, in stark contrast to the reckless management of predecessor Vladimir Romanov. Robertson is impressed with the rapid progress so far which resulted in a swift return to the Premiership. He acknowledged the huge part supporters played in keeping Hearts alive, with more than 8000 people donating monthly cash to the club through Foundation of Hearts. “We belong in the Premiership, there’s no doubt about that but unfortunately poor football play and in our case financial mismanagement means you end up in different divisions,” said Robertson. “But the good thing is that we have come back quickly and the fans have saved the club, everyone knows that. “They rallied and to get out [of the Championship] at the first attempt is brilliant because you are looking at the carnage of the play-offs and it is tough. It’s not easy and I am thankful for everyone at the football club. Robertson acclaimed the work of head coach Robbie Neilson and his coaching staff after they helped Hearts secure the league title in record time. A dominant start to the campaign last August, including wins over rivals Rangers and Hibs, set the tone for a runaway triumph. “You saw at the start that it looked like it would be a three-horse race between the three massive clubs in Hearts, Hibs and Rangers,” continued Robertson. “It certainly proved that way but the consistency of our boys and all credit to Robbie Neilson, the coaches and playing staff, they were fantastic all season. • John Robertson was speaking at the South East regional finals of the Bank of Scotland Midnight League at Tynecastle. Bank of Scotland will continue to support the Midnight League programme into 2016. In 2014, over 7000 young people participated in a Bank of Scotland Midnight League session across 90 Scottish communities.